TransSiP's ground-breaking device level power integrity (PI) technology enables the use of digital power in low power and noise-sensitive applications, bringing advantages of stability, efficiency (i.e. longer battery life), and precision to wireless portable, wearable, remote, and IoT devices. Developed using a novel methodology employing cutting-edge real-time spectrum analysis techniques revealing signal details invisible to conventional spectrum and vector signal analyzers, TransSiP's innovative JC-PFM DC-DC conversion circuit topology is applicable to a broad range of noise-sensitive applications and compatible with system-in-package devices. This patents-pending design and methodology addresses the critical needs of noise-sensitive microsystems at the heart of portable, wearable, and IoT/M2M wireless communications and navigation for clean power and high conversion efficiencies in both full and standby power modes. can be filtered and suppressed, although the variable frequency of PFM switched-mode converters can make this problematic. However, once ripple and noise on the supply bias is attenuated, TransSiP has found that noise amplitude is no longer the dominant factor. Real-time spectrum analysis provided the answer: there are very short, varying interval transient and spurious events associated with a time domain component. 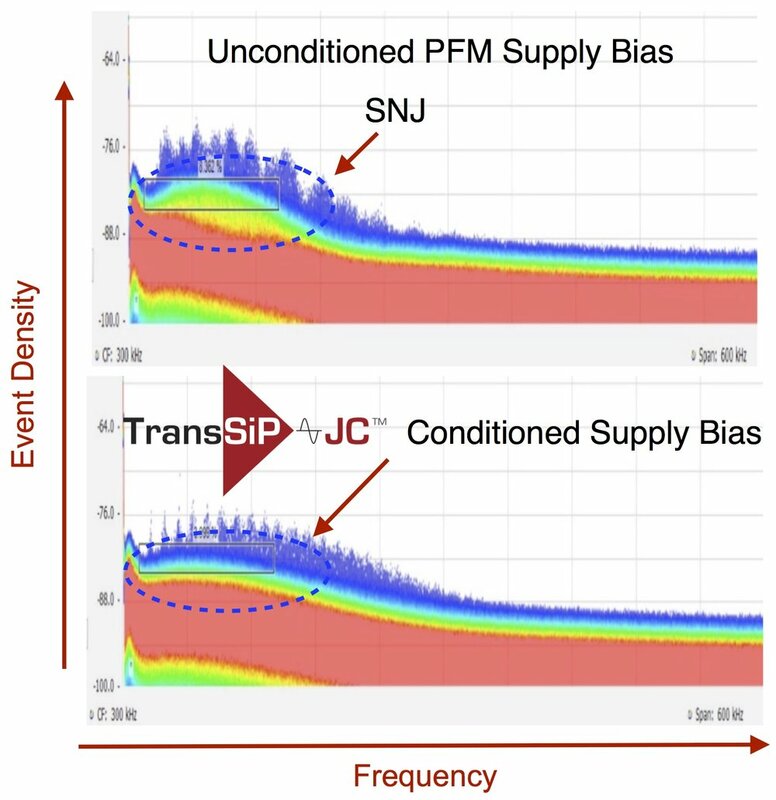 This component, which TransSiP has termed “SNJ” (switching noise jitter) is what causes the chaotic noise signatures that compromise powered system performance. Read Tektronix’ case study here. The insights provided by DPX® analysis and mathematical modelling led to the development of a new filtering concept for switched-mode PFM-type DC-DC converters. This new circuit topology can be implemented in the form of a discrete SiP component on the output of a PFM DC-DC converter, as a component set on a system motherboard, or as a complete DC-DC conversion solution: TransSiP's Symphony A2™ PI chipset. Thank you for your interest in TransSiP PI - the world’s first device level power integrity technology!